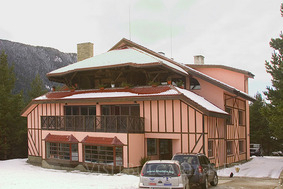 The three star hotel Temenuga opened doors during the summer 2006 and is already a preferred choice for holiday at the foot of the Rila mountain and National Park Rila. Location: The hotel is situated in the resort complex Panichishte just 15 kilometers away from Sapareva Banya spa resort. The hotel offers first class comfort and unforgettable cosiness. Accommodation: Hotel Temenuga offers 19 double rooms and three apartments on three floors. The building was projected in a typical mountain architecture, build mainly by stone and wood. •	“Bekyara” – alpine ski 580 metres serviced by a drag lift. •	Children slope 200 meters long, just in front of Pionerska chalet.